The McLaren Falls power station, was decommissioned in 1989. A bypass was later installed to allow the continued release of recreational flows into the Wairoa River on set days each year. This facilitates activities such as rafting and canoeing. Below is a PDF file containing a selection of photos from a photo album held by the Tauranga City Libraries. 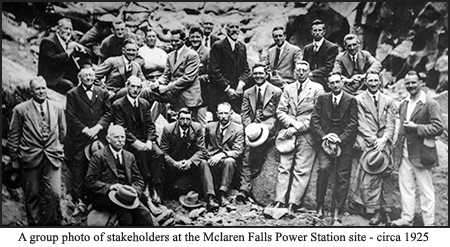 They contain images of the development of Mclaren Falls Power House, Lake, Dam and Spillway. Also included are a few relating to the Omanawa Power House. The original telegraph lines used two wires between the two stations to form a complete electrical circuit or "loop". In 1837 Carl August von Steinheil of Munich, Germany, found that by connecting one leg of the apparatus at each station to metal plates buried in the ground, he could eliminate one wire and use a single wire for telegraphic communication. On 17 August 1858 he was awarded a prize of 400,000 francs for his invention and Morse was awarded a similar prize for his telegraph system. The first trans-Atlantic telegraph cable was a single wire earth return (SWER) system. 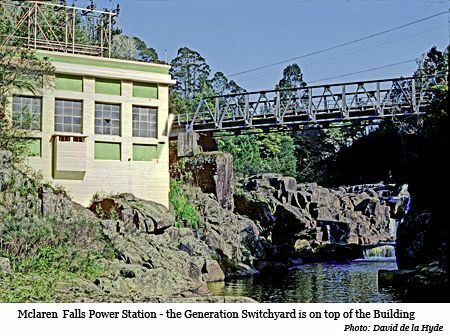 In 1925, utilising the increased supply from the commissioning of Mclaren Falls Power Station, and the formation of the Tauranga Electric Power Board, Lloyd Mandeno instigated the installation of SWER High Voltage systems to deliver power to isolated farms and other customers. In Lloyd Mandeno's own words in his address in 1947:- "So far as he was aware the Tauranga scheme was the first rural supply in any country in which the system had been adopted." Thus after a further 60 years, with no evidence to the contrary, it appears reasonable to state that these were the Worlds first Single Wire Earth Return High Voltage Power Supply Systems for isolated rural customers. 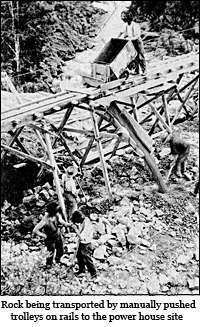 "Because of the obviously increasing demand for electricity Mr Lloyd Mandeno put forward in June, 1921 a scheme to develop a waterfall on the Wairoa River. (Later named by him McLaren Falls after the couple that operated the cook house, who had lost a son in the First World War). He stated that 3,000 to 3,500 horsepower could be obtained. A poll was put to the rate payers on 15th December, 1922 for an $180,000 loan. The Borough then having a population of 2,000 had already mortgaged itself for $140,000 on its electrical enterprise. The poll was carried by a majority of 441 to 45 mainly due to determined electioneering by people like Mr Walter Jones, the Chairman of the Electricity Committee. The overall layout of the McLaren Falls scheme is as in the diagram at the top left. A concrete arch dam was built in a narrow gorge where the water was normally 6.7 metres deep. A 487 meter long 2 metre square diversion tunnel was driven from just above the water below the present bridge to the river above the dam site. A branch to this tunnel was then driven under the deep pool at the dam site to drain it while the dam excavations and filling were carried out. A bunkhouse for up to fifty men was erected just between the existing sharp bend of McLaren Falls Road and the present lake. The work force peaked to seventy men. 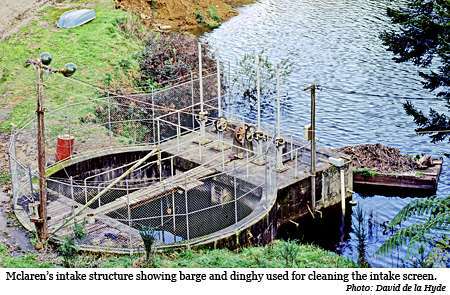 A storage shed derrick and crane were constructed on the Wairoa River near the Omanawa Bridge. Cement and other supplies were carried to this point by punts and thence to the Falls by road. The powerhouse and arch dam were constructed using the local rhyolite rock for fine and coarse aggregate. All structures were designed so as to impose low stresses on the concrete. The quarry for the power house rock was situated downstream on the same side, the rock being transported by manually-pushed trolleys on rails. 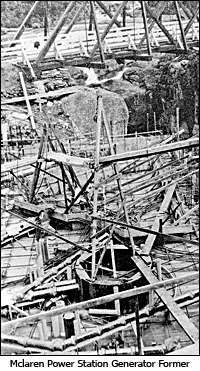 The static head was 26 metres, the arch dam being 24.5 metres high. After two and a half years of design and construction the first of two 1,400kW vertical shaft turbine-generator sets was started up on 25th June, 1925, the second starting a few months later. 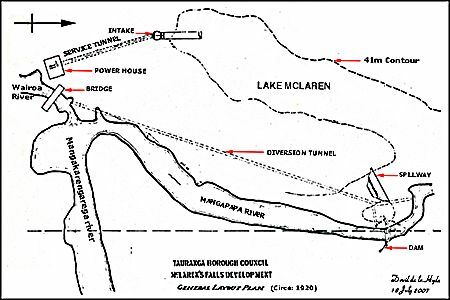 A third tunnel was built to divert the Mangakarengorengo Stream into the twenty hectare Lake McLaren. The total cost of the scheme was $165,764." Reference: "Tauranga 1882-1982: The Centennial of Gazetting Tauranga as a Borough" edited by A.C. Bellamy. Tauranga City Council, 1982. 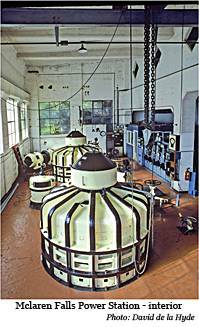 The SWER sysyem made it economical to supply power to sparsely populated areas, a system later used by countries such as Australia, South America, South Africa, India and the Soviet Union. 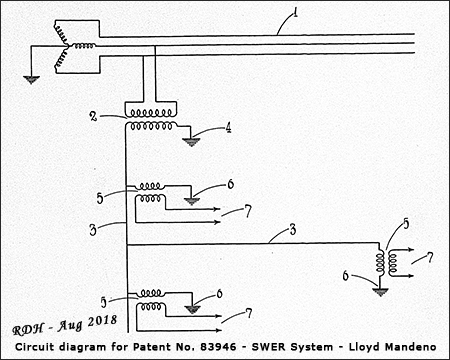 Below is the 30th October 1940 patent application for the SWER system by Lloyd Mandeno.